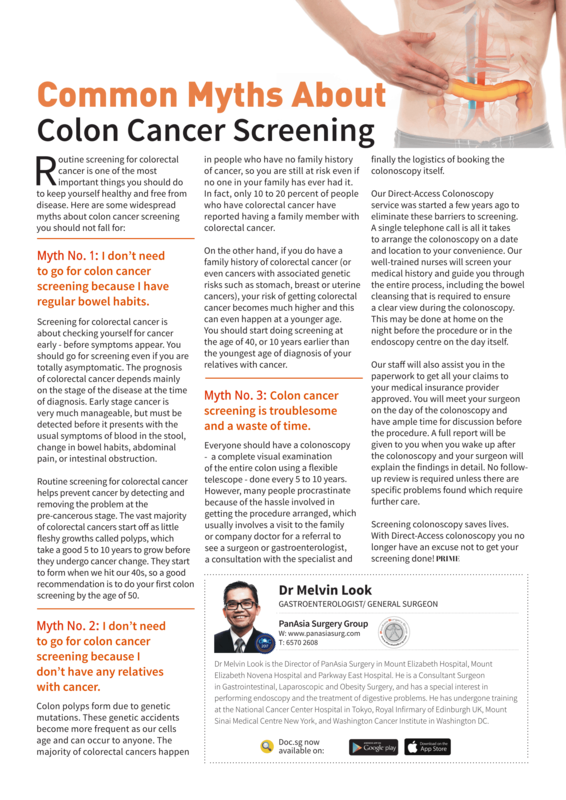 Find out the common Myths About Colon Cancer Screening from PanAsia Surgery Medical Director, Dr Melvin Look as he speaks to PRIME Magazine. Myth No. 1: I don’t need to go for colon cancer screening because I have regular bowel habits. Screening for colorectal cancer is about checking yourself for cancer early- before symptoms appear. You should go for screening even if you are totally asymptomatic. The prognosis of colorectal cancer depends mainly on the stage of the disease at the time of diagnosis. Early stage cancer is very much manageable, but must be detected before it presents with the usual symptoms of blood in the stool, change in bowel habits, abdominal pain, or intestinal obstruction. Routine screening for colorectal cancer helps prevent cancer by detecting and removing the problem at the pre-cancerous stage. The vast majority of colorectal cancers start off as little fleshy growths called polyps, which take a good 5 to 10 years to grow before they undergo cancer change. 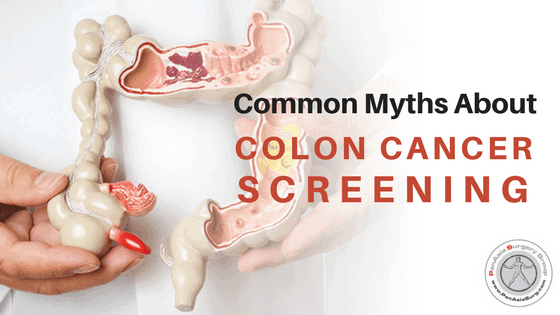 They start to form when we hit our 40s, so a good recommendation is to do your first colon screening by the age of 50. Myth No. 2: I don’t need to go for colon cancer screening because I don’t have any relatives with cancer. Colon polyps form due to genetic mutations. These genetic accidents become more frequent as our cells age and can occur to anyone. The majority of colorectal cancers happen in people who have no family history of cancer, so you are still at risk even if no one in your family has ever had it. In fact, only 10 to 20 percent of people who have colorectal cancer have reported having a family member with colorectal cancer. On the other hand, if you do have a family history of colorectal cancer (or even cancers with associated genetic risks such as stomach, breast or uterine cancers). your risk of getting colorectal cancer becomes much higher and this can even happen at a younger age. You should start doing screening at the age of 40, or 10 years earlier than the youngest age of diagnosis of your relatives with cancer. Myth No. 3: Colon cancer screening is troublesome and a waste of time. Everyone should have a colonoscopy – a complete visual examination of the entire colon using a flexible telescope- done every 5 to 10 years. However, many people procrastinate because of the hassle involved in getting the procedure arranged, which usually involves a visit to the family or company doctor for a referral to see a surgeon or gastroenterologist, a consultation with the specialist and finally the logistics of booking the colonoscopy itself. Our Direct-Access Colonoscopy service eliminate these barriers to screening. A single telephone call is all it takes to arrange the colonoscopy on a date and location to your convenience. Our well-trained nurses will screen your medical history and guide you through the entire process, including the bowel cleansing that is required to ensure a clear view during the colonoscopy. This may be done at home on the night before the procedure or in the endoscopy centre on the day itself. Our staff will also assist you in the paperwork to get all your claims to your medical insurance provider approved. You will meet your surgeon on the day of the colonoscopy and have ample time for discussion before the procedure. A full report will be given to you when you wake up after the colonoscopy and your surgeon will explain the findings in detail. No follow-up review is required unless there are specific problems found which require further care. Screening colonoscopy saves lives. With Direct-Access colonoscopy you no longer have an excuse not to get your screening done!